Laguna Beach, CA, is a picturesque seaside town perhaps best known for the early 2000’s MTV reality show of the same name. But after a city council meeting last week, the town is in the news for its progressive animal advocacy efforts. 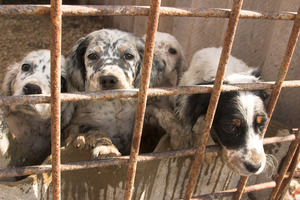 Puppy mills are notorious for poor living conditions and inhumane treatment of animals bred there. On March 6th, the Laguna Beach City Council voted unanimously to outlaw the retail sale of dogs and cats in their city. This citywide ordinance, sponsored by Councilwoman Elizabeth Pearson, would essentially prohibit inhumane commercial breeders – better known as “puppy mills” – from profiting off of the pet store sales of puppies. The ban also covers the sale of kittens. “It just has to do with preventing unethical breeders from selling, from mass producing animals for sale at retail stores,” Pearson said after the council’s decision. Many dogs and cats sold in retail pet stores have been found to come from large-scale breeding operations. The ban does not extend to reputable, licensed breeders, animal rescue organizations, or veterinarians. Laguna Beach resident and President of Social Compassion in Legislation Judie Mancuso presented a statement at the council meeting. Mancuso hopes that the ban will encourage more people to adopt pets from animal shelters and rescue organizations. The Laguna Beach ban is one of several anti-puppy mill measures to pass across the state of California; similar pet sale bans have passed recently in Irvine, West Hollywood, South Lake Tahoe, and Dana Point.